As another post for our Charts and Tables category, we are highlighting the historical P/E ratios of the ten major US economic sectors of the S&P 500. Below we highlight Financials, Industrials and Technology. As shown in the charts, divergence has been created in all three sectors since the bull market began. 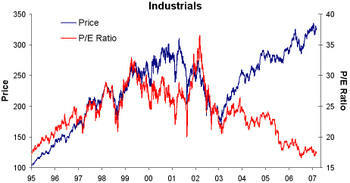 The P/E ratio of Industrials has continued to decline even as its price has gone up. 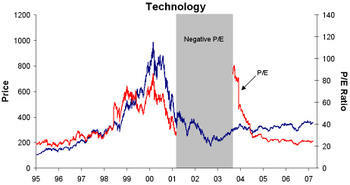 While Technology's P/E is much lower than it was during the bubble years, its P/E has remained flat for the past three years. We'll be back with the rest of the sector charts shortly. can you do biotech companies next? Good charts. Just like end of 1995, I think a major rally in the markets is coming because expectations are very low and people are still worried about a recession. Once they realize there isn't going to be one (great jobs report today) the market will shoot higher. I personally like the defensive names-telecom, utilities, real estates in the US. Improving fundamentals plus lots of push from private equity-you are with the smart money on these sectors. Any clue on the highest P/E ratio for a company ever recorded? And the highest P/E ratio for company as to date? Can you provide a link for historical price and P/E ratio for individual stocks over last 50 years? 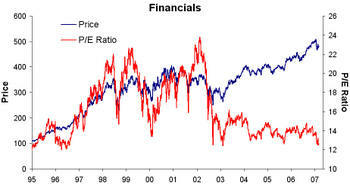 Can anyone tell me where I can get sector historical P/E ratios in data form? I reall want to do some research using these metrics.